6:40 p.m., July 20, 2012--Edward Arthur Trabant, the 22nd and 24th president of the University of Delaware, died at 3 p.m., Friday, July 20, at the Cokesbury Village Health Care Center in Hockessin, Del., after a brief illness. He was 92. "E. Arthur Trabant guided the University of Delaware through a crucial stage in its development into a national university," UD President Patrick T. Harker said. "When he stepped down as president a second time in 1990, the University was a much different institution from the one he came to in 1968--with nearly twice as many undergraduates, a range of innovative academic programs and an expanded physical campus. His legacy shines today on our campus and in the accomplishments of the many students, faculty and colleagues he led for more than two decades." Noted Delaware historian Carol Hoffecker said, "E. Arthur Trabant came to the University of Delaware in the late 1960s, a time of campus unrest coupled with the rapid expansion of the student body and faculty. From the first he demonstrated leadership skills that turned these difficult circumstances into great opportunities for the University and for the state of Delaware. … The University of Delaware, its students and faculty and our state owe a great debt of gratitude to this courageous, visionary and humane individual." To read more remembrances from President Trabant's colleagues and friends, click here. President Trabant's 19-year, first term, from 1968-1987, was one of the longest presidencies of a major university in modern times. He led the campus through a period of tremendous growth of both the student body and physical plant. Undergraduate enrollment rose from less than 7,500 to more than 15,000, new academic programs were developed and the physical campus grew with the addition of residence halls, classrooms and research buildings. Concerned with educational opportunities for women, he created a Commission on the Status of Women and an Office of Women's Affairs. His many accomplishments included the creation of what is now the College of Earth, Ocean, and Environment; the prestigious Winterthur/University of Delaware Program in Art Conservation; the Institute of Energy Conversion, a pioneering unit in the field of solar energy research; Winter Session; the development of what is now the Osher Lifelong Learning Institute; the University Honors Program; and the forerunner of what is now the Associate in Arts Program. Among the buildings added to the campus during his tenure are Clayton Hall, Smith Hall, Purnell Hall, Kirkbride Lecture Hall, Willard Hall Education Building, McDowell Hall, Amy E. du Pont Music Building, McKinly Laboratory, Spencer Laboratory, Worrilow Hall, Christiana Towers, Dickinson Residence Hall Complex and the University's marine studies campus in Lewes, as well as a major addition to the Morris Library. He also expanded the University's partnership with state departments, private businesses, research interests and overseas institutions. In the area of athletics, President Trabant presided during the Title IX years and played a key role as Delaware's women's athletics program moved from an experimental program to varsity status in the early 1970s. During his tenure, UD football had 183 wins -- the most of any UD president -- and three national titles. He returned to the presidency in 1988, after the resignation of his successor Russel C. Jones. At the conclusion of his second term, in 1990, the University Board of Trustees, named him president emeritus. At the University's Commencement in May of that year, Andrew B. Kirkpatrick Jr., chairman of the University's Board of Trustees, officially conferred on him the title and said, "As the 22nd president of the University, he guided the evolution of the University of Delaware during periods of turmoil, change, growth and challenges, and through his vision and courage, guided the direction of the institution to a prominent position among colleges and universities in the United State; as 24th president of the University, Arthur Trabant has served with steadfast loyalty and devotion, restoring faith and commitment to the institution from all members of our University community." In an interview at the end of his second term, President Trabant said his overriding goal had been "to try to make an environment where people could fulfill themselves and at the same time see how they could be part of a university community by contributing to the overall advancement of the University, as well as their own careers." In 1996, the Trabant University Center was named in his honor. At the dedication ceremony, Kirkpatrick said, "Together, Art and [his wife] Jerry and their synergy have provided the University of Delaware and the state of Delaware with a unique legacy of integrity, compassion and understanding that will be memorialized for all time by this signature building we dedicate today." Each year, the University presents the E. Arthur Trabant Award for Women’s Equity, created in recognition of President Trabant’s support for women’s equity. The award is given to an individual, department, unit or committee that has contributed to the equality of women on campus. Edward Arthur Trabant was born Feb. 28, 1920, in Los Angeles. A 1941 graduate of Occidental College, he received his Ph.D. in applied mathematics in 1947 from the California Institute of Technology. 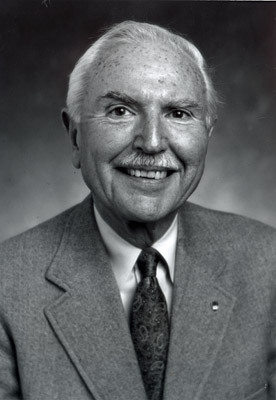 From 1947-60, he held a variety of positions at Purdue University, including professor of engineering, director of a nuclear engineering laboratory, head of the Division of Engineering Sciences and assistant dean of the graduate school. President Trabant served as dean of the School of Engineering at the State University of New York at Buffalo from 1960-66, and was vice president for academic affairs at the Georgia Institute of Technology from 1966-68, before coming to UD. President Trabant served on the executive committee of the National Association of State Universities and Land-Grant Colleges and on the boards of the Winterthur Museum, the Wilmington Medical Center, the Delaware Art Museum, the Council on Administration of Justice and the Governor's Technical Advisory Committee. He was a member of the American Society for Engineering Education, ASME, the American Mathematical Society, the American Nuclear Society, Phi Beta Kappa and Sigma Xi. President Trabant is survived by his wife of 68 years, Jeraldine Merlyn Shanessy Trabant, and their three daughters, Jeri, Arta and Amanda.